Dr. Rodriguez – Martin is a native Floridian. He has also completed more than 250 hours of continuing education in implantology, cosmetic dentistry & orthodontics. The most important thing you can do for good oral health is brush and floss your teeth daily. But we’re not born knowing how to do either — they’re skills we must learn and practice to be effective in removing disease-causing bacterial plaque. It helps then to have a good understanding about technique, implements or problem situations you may run into. So then, here are answers to 4 typical hygiene questions that can help you improve your brushing and flossing. How often should I brush and floss? You should brush and floss at least once a day to prevent a buildup of plaque, the cause for both tooth decay and periodontal (gum) disease; if you have some form of dental disease, we may advise a different frequency. Be sure to use a gentle technique — it doesn’t take much pressure to remove plaque and being too aggressive can harm your gums and tooth enamel. When should I change my toothbrush? If you use it correctly (gentle vs. aggressive), your toothbrush should last several months. When you begin to notice the bristles becoming worn or splayed, it’s time to get a new, soft bristle brush. What kind of toothpaste should I use? You may have a preference among the dozens available when it comes to flavor and texture. But from a hygiene standpoint you should choose one that contains fluoride to strengthen enamel and an anti-tartar agent to inhibit the formation of hardened plaque deposits (calculus). While we’re on the subject, don’t rinse out the toothpaste right after brushing — you may be washing away fluoride too early, which takes time to work in contact with tooth enamel. Just spit it out. 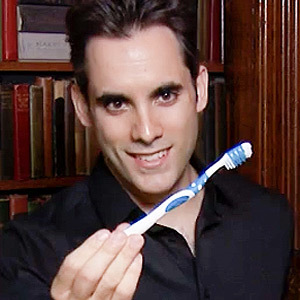 What if my teeth are sensitive when I brush? 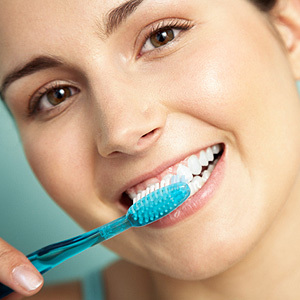 If you encounter problems when you brush, visit us to find out the cause. The most common cause for sensitivity is gum recession, usually due to gum disease, which has exposed the roots. This can cause discomfort when you encounter hot or cold foods, or pressure on the teeth when you brush. You should then receive treatment for the underlying condition; we may also recommend toothpaste that reduces tooth sensitivity. And, of course, be gentle when you brush. Find out if dentures could offer you the new smile you’ve been looking for. Am I a Candidate for Dentures? Pretty much any patient who has lost all or most of their teeth could benefit from dentures. The current health of your teeth and gums will dictate whether you will require partial or full dentures. Ideal candidates will also be willing to maintain good oral hygiene and care for their dentures properly. Which Kind of Dentures Are Right for Me? Full dentures: These dentures are the best option for someone who is missing all of their teeth. Partial dentures: These dentures are good for patients who still have some healthy teeth. Implant-supported dentures: Implants are placed into the jawbone where they anchor either permanent or removable dentures. Since implants fuse with the bone and tissue around it, implant-supported dentures are more stable then regular dentures. Immediate dentures: These are a good option for those who need dentures the same day as a tooth extraction. Come into our Delway Beach, FL dental office today to discuss your dental options. The team at Brilliant Smiles Dental is ready to give you a brand new smile to feel confident in. Schedule a consultation with us today!